Another larger autograph version of the present composition is published by Nicola Spinosa in Pittura napoletana del Settecento dal Barocco al Rococo, Naples, 1988, p. 136, no. 136 and p. 263, fig. 154 (oil on canvas, 140 x 192.5 cm.). 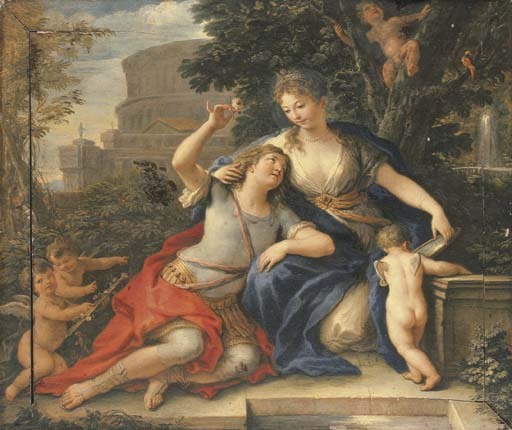 In the larger painting, which Spinosa dates to the 1690s or 1710s, the composition is cropped along the top edge and the artist has replaced the open landscape with classical buildings seen here in the background on the left with two soldiers who watch the young lovers.